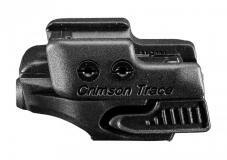 The Rail Master Universal Laser Sight is an instantly-activated universal laser sight for Picatinny or Weaver rail-equipped pistols and rifles. The CMR-201 marks Crimson Trace's first universal fit laser and is built with industry-leading quality, ergonomics and fit. Rail Master Universal Laser sight fits pistols, rifles, and shotguns with M1913 Picatinny or Weaver accessory rail including: 1911 Government or Commander with Rail, AR-15/M16 or similar rail-equipped long guns , Beretta PX4 full size and compact, 92Vertec, Glock 3rd Gen 17, 19, 20, 21, 22, 23, 31, 32, 34, 35 and 38, Glock 4th Gen 17 and 19, H& K P30, 45, 45C, Ruger SR9, SR40, SR9c, SR40c, Sig Sauer P220, P226, P229, S&W M&P full size and compact, S&W SD, Springfield Armory XD and XD(M), pistols with a minimum of 1-1/16" from recoil lug.